This looks great, Carol I love Julie's work. Thanks for sharing this! It's a wonderful book. Always a treat when a new Julie book comes out. I'm a longtime fan too. Thanks for featuring VIVID this week. I adored this book, Flutter and Hum, too, Carol. I loved the poems, but equally the extra research Julie shared about the colors. Yes! That snail collecting amazed me to learn! So glad you're doing this first step for Cybils and can't wait for what you send to the 2nd round. Happy Thanksgiving! Oh, how beautiful and fun....AND informative. Thank you for sharing this gem. I love that long dive into deeper and deeper blue. I love the blend of facts, figures, fun and fancy! 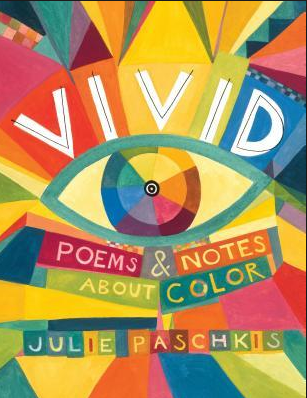 I love Julie Paschkis's art and clever poems! Thank you for giving us a peek into this book. This book looks fabulous! It would be perfect for my friend who is an art teacher. I am a Julie Paschkis fan too--will have to look for this book. It looks wonderful! 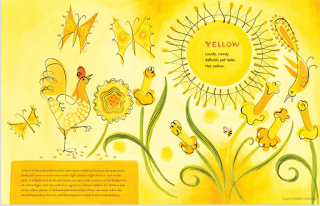 Thanks for reviewing Julie's colorful book, I'm familiar with "Flutter and Hum, and look forward to reading this one too!